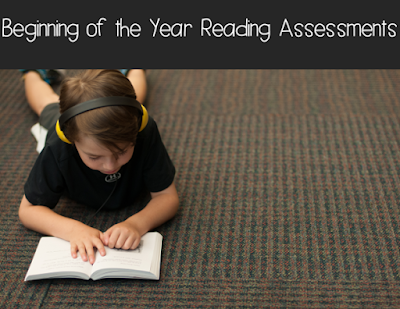 Time to give those reading assessments! - All Things Special Ed. Time to give those reading assessments! New school year? New student? Mid year or end of year? Time to take that reading data!! 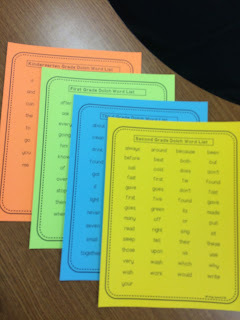 Two reading assessments I give to all my special education students are running records and a sight word test. If your a new teacher with limited resources then I have some great suggestions on how you can do this on a budget. If your lucky enough to have a school that already has a reading kit such as Fountas and Pinnell's BAS (Benchmark Assessment System) or Rigby PM Benchmark Kit then you are already in the game. If you are not so lucky (been there, done that!!) then one resource I would highly suggest purchasing (even if it is with your own money- trust me well worth it) is Reading A-Z . See pictures below 2, screenshots on the different types of books with guided reading lessons and the assessments that come along with this subscription!! To help pick out books to teach with your students at their instructional level (as well as independent reading level) you will need to give them a running record. This can be tricky at first if you have a new student but hopefully you have some previous data (IEP, previous reading level/running record) to help you decide what level to try first. If it is a special education student of mine, I typically would try 2 grade levels below from their current grade level, then gauge from there. TIP: Feel free to stop in the middle of a running record if you think it is too difficult/frustrating or too easy (ie too many words missed or is reading everything with accuracy and fluency). 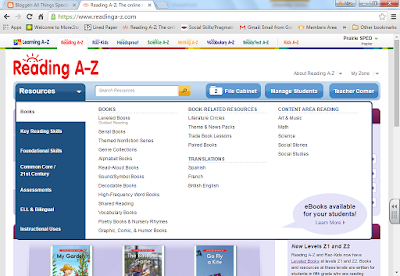 Check out this correlation chart on Reading A-Z you can print off. Get your running record form, it comes with the text, from the book printed on the form, so you can mark the students accuracy (and fluency if you wish to take that) as well as ask comprehension questions and you will also need the book for your student to read from. Now if you have never given a running record, I would suggest touching base your schools reading teacher, literacy couch et al. and I am sure they would be happy to guide you through the process of all the marks and how to analyze one. Also Reading A-Z has a great tutorial (see why I said they are such a great investment- I should start being their spokesman!!) on the how to's of running records. running records are taken most often at the earlier stages of reading. Students who are not progressing at the expected rate should be assessed even more frequently than the schedule suggested below. 2. Select the book at appropriate reading level (you are trying to find their instructional level- the level you will teach them at). 4. For my younger students I check mark above each word read correctly, for higher students that might be too much so feel free to not mark correct reading. 5. If the student reads a word incorrectly, record the word s/he read above the correct word. 6. Intervene as little as possible. 7. If the student is stuck for 5-10 seconds tell him/her the word and record on your chart. Several terms are used when marking a running record form. You should become familiar with these terms by reviewing the explanations below. Self-correction (SC)--Self-correction occurs when a child realizes her or his error and corrects it. When a child makes a self-correction, the previous substitution is not scored as an error. Meaning (M)--Meaning is part of the cueing system in which the child takes her or his cue to make sense of text by thinking about the story background, information from pictures, or the meaning of a sentence. These cues assist in the reading of a word or phrase. Structure (S)--Structure refers to the structure of language and is often referred to as syntax. Implicit knowledge of structure helps the reader know if what she or he reads sounds correct. Visual (V)--Visual information is related to the look of the letters in a word and the word itself. A reader uses visual information when she or he studies the beginning sound, word length, familiar word chunks, and so forth. After you have finished giving your student a running record, you will need to analyze it. This will determine if you need to give another running record or if you have found their instructional level. Feel free to ask me questions about running records plus there is a ton of information out on the web and resource books to help you. I also will test my students sight word knowledge during the school year. 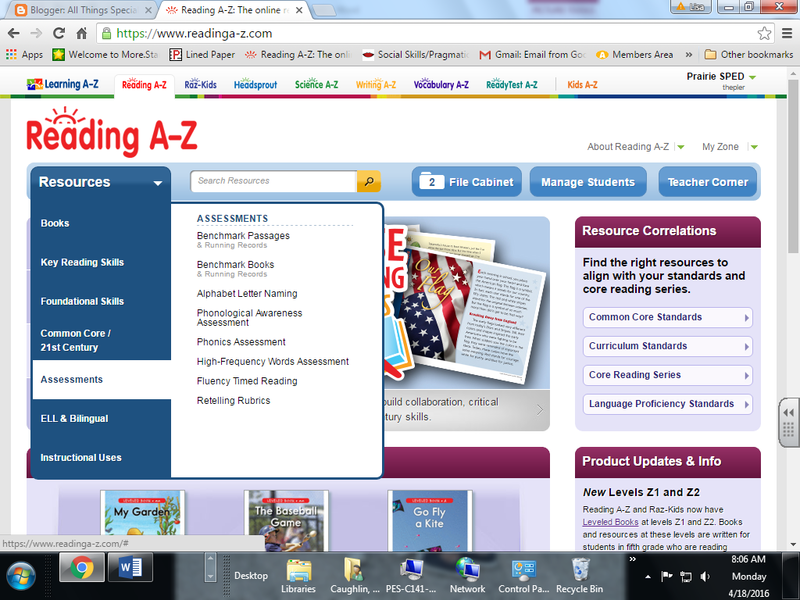 This helps me to also gauge their reading level and what words they need to practice and learn. Sight words are important to learn as you cannot sound them out and they are the most common words found in text. If I am working with a student with autism (and/or intellectual disability), and they are struggling at a beginning reading level as well as with comprehension, I will begin teaching them the Dolch Noun words. This will help them correlate the word to a picture. It can be very hard for some to understand what the word "it" is or the word "the". These words can be very abstract for our black and white thinkers!! 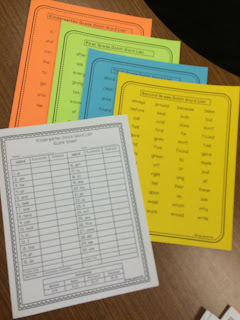 Here are the forms I use to track my students Dolch Sight Word data (K-3rd grade words). 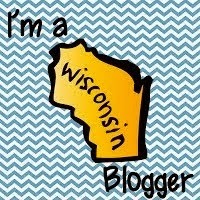 You may get your free copy here in my TPT store.